Hello all - my husband has been away for 2 weeks so I've been a tad busy running the home (trying not to set it alight - more of which in my next blog post). So forgive the absence. I am currently about 13 stone 7lbs so definitely need to get myself together before Christmas. I am still loving the Boot Camp on a Friday and it'll be my 4th one on Friday. Anyhow, more of the chit chat in another post. 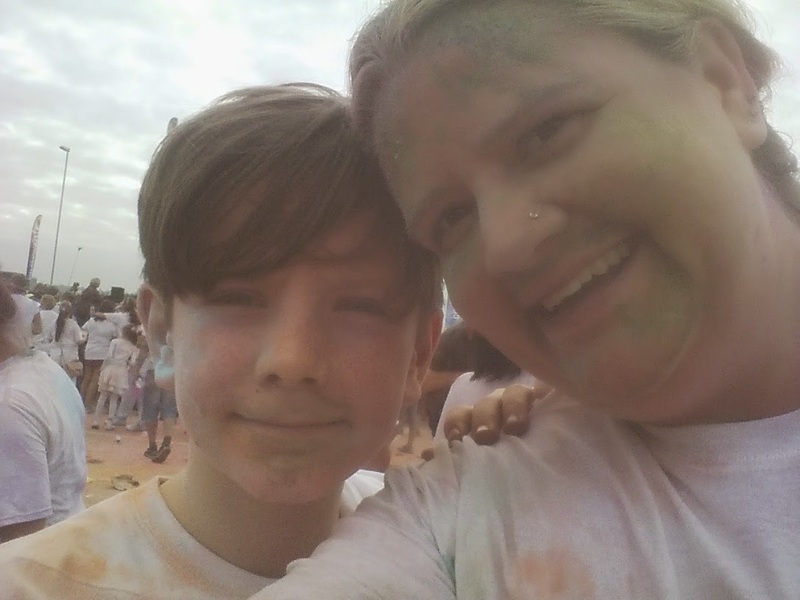 The lovely Kat ran a 5km with her son in a blaze of colour. Here's her post - an honest, touching and funny account. Enjoy! 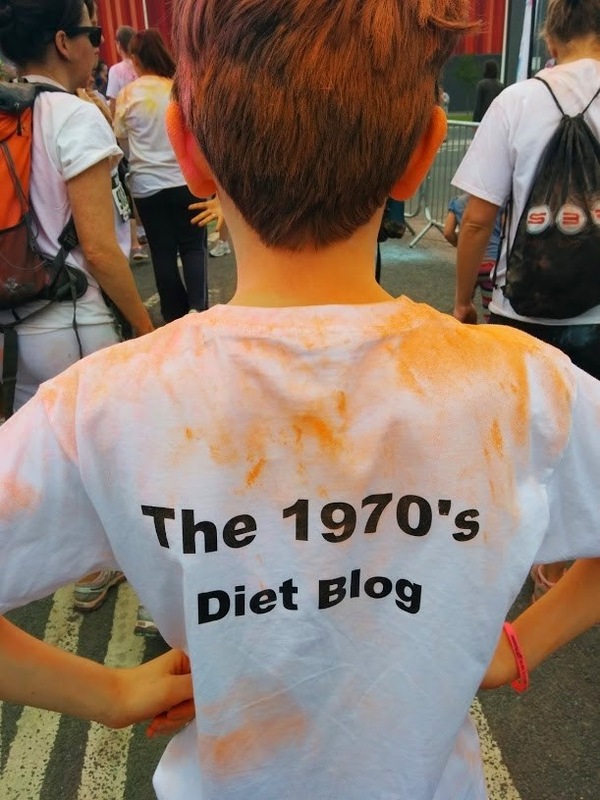 When The 1970s Diet Blog asked me if I was interested in doing the Run or Dye 5k event for free in return for blogging about it and taking pictures, naturally I jumped at the chance! I have never done an organised run before and was totally up for the challenge. I’d booked a 10k run for October and figured the 5k would be good practise. 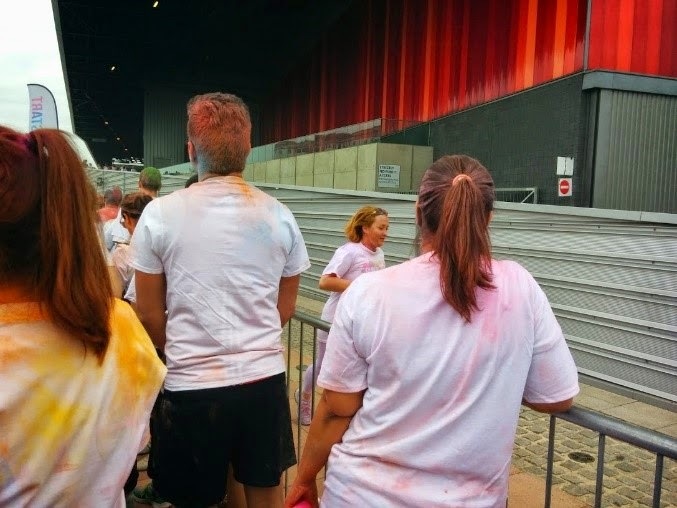 Ever since hearing about Run or Dye, I’d be dying to do it (see what I did there?!) so I was really excited. Booking online was an easy process. The cost of registering goes up exponentially over time so the earlier you book, the cheaper it is. The cost varies between £23 and £35 depending on when you book and whether you run as an individual or not (it’s cheaper to run in a team of 4 or more). Kids are the same price as adults and I booked for me and my 12 and 9 year old. A few weeks before the event I got an email asking to sign a waiver and print tickets. Running practise was going well for weeks and I was doing a fast 5k in around 30 minutes. 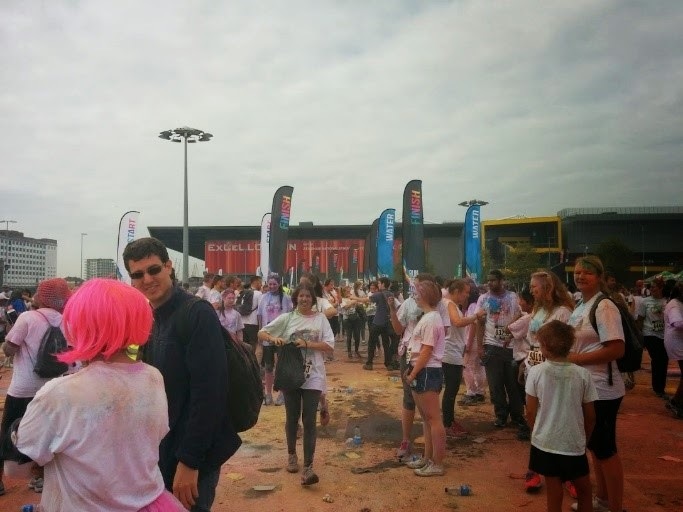 After a long holiday abroad in the summer I forgot about running so when the Run or Dye event day was approaching I got in a bit of a panic. I ordered white t-shirts (to show off the dye) and mentally prepared myself. My son was really looking forward to it but my daughter pulled out. The night before we went to stay with my parents in London so we would be closer to the event at Excel, Docklands. I was really disappointed to receive an email from Run or Dye to say that their Swagbags hadn’t arrived in time and would be substituted. Saturday morning race day arrives at last and Alex, my son and I head off early on the train. Unfortunately all trains to London are cancelled due to engineering works! So off we trot on the bus. We head upstairs and prepare to enjoy the hour and half long bus journey to Waterloo followed by a couple of tubes. We’re running late, sweaty and exhausted already. 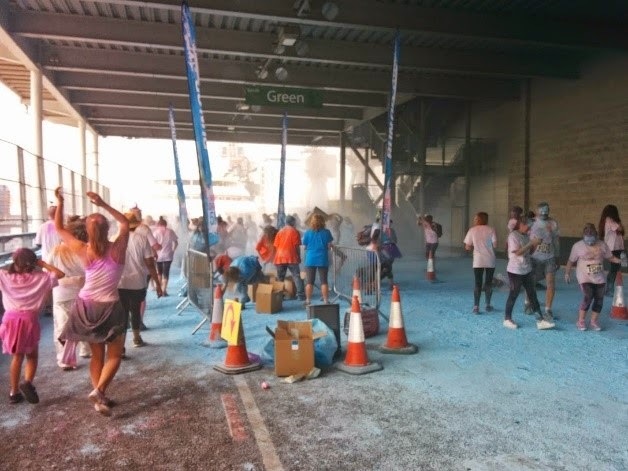 When we arrive at Docklands, we unwittingly get off at the wrong stop along with a dozen or so other late runners (you can spot them in their running garb and Run or Dye t-shirts). We’re half way round the track and have to walk 2.5k to get to the start. Worn out, late and worried they won’t let us join in means nothing when we get around the corner and see the start line-up. It’s manic! The queue goes on forever. The advantage of being late and having already pre-registered online means the queue for registration is quick and easy. Dozens of brightly coloured people are milling around. The ground is covered in dye and it looks like an explosion in a paint factory full of clowns. We get our bibs and t-shirts, tattoo, wristbands and a couple of packs of dye (no Swagbags though.) Now up to this point I had no idea what the dye was. I thought it was like hair dye but in fact it’s like ground up pastel chalk. It has no smell and brushes off easily. Alex can’t wait to open his packets and throw them over himself and me. 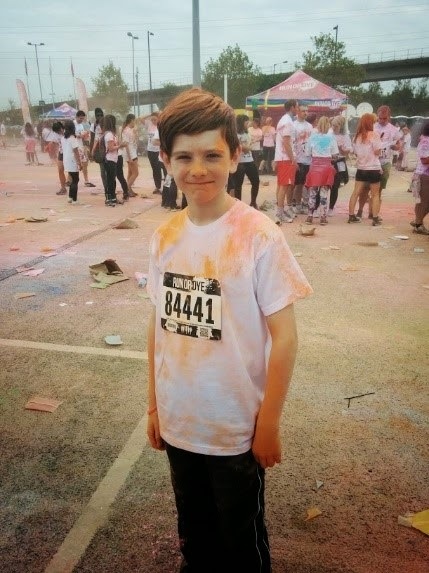 I thought you got the dye AFTER the race so was a bit surprised that everyone was already covered. The party had started already! Pretty soon we find ourselves he rded into the end of the queue at the start line. The first runners were already coming back! (You know the serious ones) without an ounce of sweat on them. We are waiting in the crowd shuffling slowly forward and Alex is getting a bit bored at this point. He just wants to run already. I’m just soaking up the atmosphere. There’s music blasting, an entertaining DJ, funny chatter, fancy dress and the feel of a festival. The weather is glorious for a late September day and everyone is really chilled and happy. Finally after about a 45 minute wait, we get to the front and off we go. Takes a while for the crowd to disperse as the slow runners and the fast runners separate. I jog a little and walk a little. Alex runs off and have to reign him in explaining not to use all his energy at once. He doesn’t listen and leaves me behind promising to meet me at the finish line. I’ve been abandoned by my 12 year old but I carry on at my fast pace. I’m mostly keeping up with the same people I was queuing with. I’m not with any serious runners and it’s a great atmosphere. Everyone is chatting and high fiving and having a lot of fun. I’m so excited when I get to the first dye station. Everyone has stopped there and are flinging dye everywhere. I try to get myself a bit more covered but it’s too busy and on I go. Each station has a different colour. It doesn’t take long and I surprise myself when I get to the half-way point. It’s not a circular route so you literally turn around and head back and pass people who were queuing behind you on the way back. I note that I haven’t seen Alex again and imagine him already at the finish line waiting for me. I bump into a family walking very slowly with a little boy wearing The Lily Foundation t-shirts. Having a young disabled son myself, it was deeply moving to watch. His mum and dad explain to me he has mitochondrial disease. It’s a rare untreatable genetic disorder just like my little boy’s disease. I’m in awe of the family and find myself wondering if my little boy will ever be able to do a 5k with me. I wish them all the best as I pass them. Already planning in my head if I could take my youngest son on the next Run or Dye event in his wheelchair covered with a see-through rain-mac! I make a mental note to spot anyone else with a buggy or wheelchair and I do! Heading back through the dye stations it’s turned into mayhem. There is so much chalky dye on the ground people are slipping and sliding in it. I even spot a couple of runners doing, er, dye angels on the ground! It’s so cloudy with chalk you can’t see where you are going. Near the end, the finish line, I spot a few cheats who haven’t double backed. Why cheat on a 5k? It’s not a race, you’re only cheating yourself after all. I’m tired and thirsty but I’m determined to do it. Getting towards the finish line, I see Alex waiting patiently for me with a bottle of water. I run towards the finish line (like I was running the whole time, everybody does it) and I get a little cheers from the small crowd gathered and a volunteer hands me my free bottle of water. Alex had only arrived 10 minutes before me so I was quite pleased. I did it in about 55 minutes and Alex about 45 minutes. I down the whole bottle of water and feel very pleased with myself. I can still breathe so that’s a bonus. There’s a stage rigged up, an after party and a colourful bopping audience. Everyone has had a fantastic time and clearly enjoying themselves. 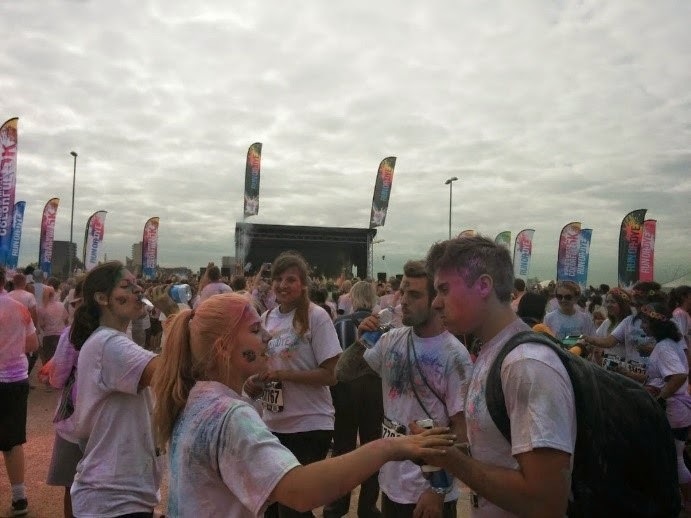 There was a large multi-cultural mix of people at the beginning but now we are all just blue, green, pink, purple and orange. You can’t tell the men from the women. It’s a beautiful rainbow of happy humans. Alex and I head off again. Next destination is McDonalds…. 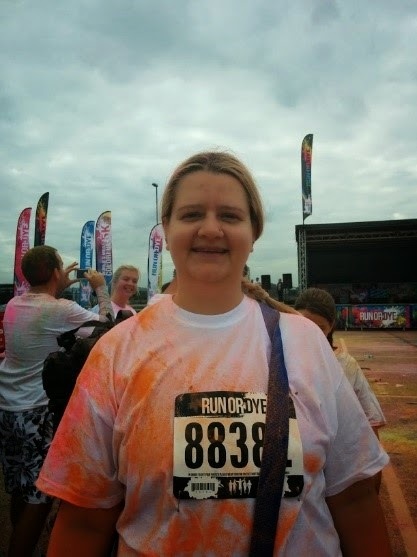 For more information about Run or Dye visit http://uk.runordye.com Entrance fee was paid for by Run or Dye. I was not paid to do this post and all opinions and photos are my own. 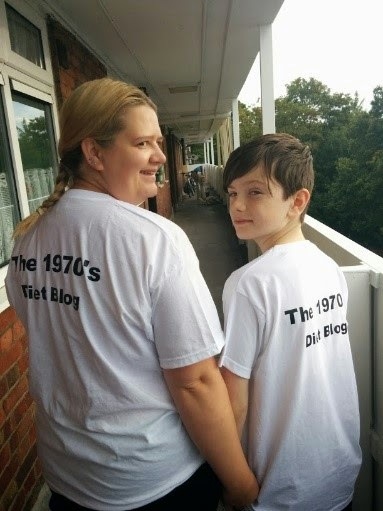 Thanks Kat for a lovely post!